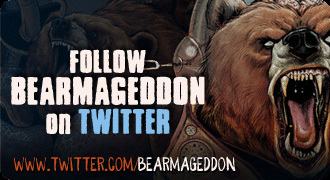 Bearmageddon - But wait, there’s more! Hey just found your comic and even though bears are terrifying, we’d definitely be interested in adding your comic to the site. You can also have a custom artwork banner and custom user archive links should you choose to join. Hope to hear from you soon, long live web comics. I tried to send some inking samples to [email protected] and got a delivery failure notification from hotmail. Is their a limit to the size? I am a math teacher at a small high school in Maine. 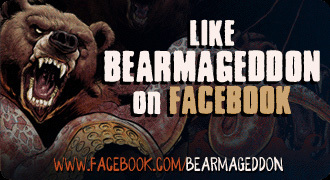 In coaching the math team, I was turned on to Bearmaggedon and think it’s absolutely fantastic. 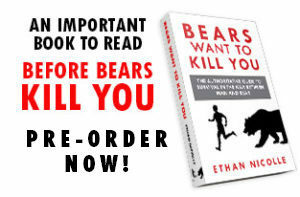 We have even considered using one of your many bears as a mascot. I was wondering what hoops I would have to jump through to get or use an image of yours on a T-shirt for the team. The students would love it, and it would definitely be a unique shirt to wear to the competitions! Let me know if anything like this would be possible. Thanks! I must not get notificatiions for the comments on this page or somethhing. I’m so sorry I missed this, I would have been happy to let you use my art for your team. Next time email me direct. I don’t always get to the comments. Sorry about that! Hey, great comic, loving it. I was curious, I’m working on my own web comic, and I was wondering what all did you do in the copyrighting of this comic. I’ve looking at the copyright website, and I’m just wondering what all materials I need to include for copyrighting it. Character designs & bios, script (full or or just an outline) or just a story synopsis, etc. Saw this and thought of this storyline. Noted your pop-up “Tool tip” about putting gasoline in balloons: correct that it would be difficult, but not because of pressure issues. Gasoline goes through a rubber balloon without even stopping. The rubber dissolves. Cliff climbing bears…you haven’t updated lately because your comic wasn’t just for entertainment, was it…I knew it!